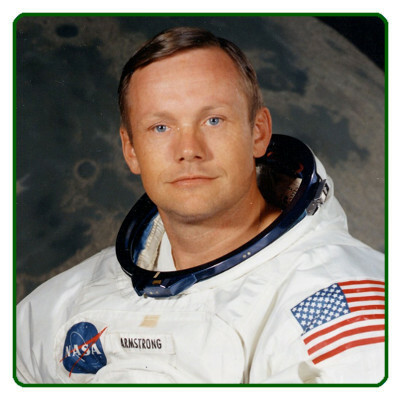 Now that some time has passed and everyone has said his piece about the death of Mr. Neil Armstrong on August 25th, 2012, I have had time to process my thoughts on his passing. In spite of some harsh words I posted back in January of 2011, Mr. Armstrong was my hero. I suppose it isn’t so much the man that I respected but everything he represented. I was born too late to enjoy the moonshots as they happened. I was only three years old when mankind first made his mark on the lunar surface. But, the static excitement of the moment was still arcing in the air in my preteen years. I fully expected that lunar travel would be the norm when I reached my current age. With Neil’s passing, I acknowledge that my childhood dream will never reach fruition. I’m stuck on planet Earth. My life at times is marked by interesting coincidences. This is yet another one of those times. On the weekend prior to Armstrong’s death, I visited a used bookstore. It is a quaint shop to which I go not to find a particular book, but to discover something new. Among my finds was a book by Dan Simmons called Phases of Gravity. The book centers on a fictional lunar astronaut from the Apollo program. It takes place in the late ’80s—after the Space Shuttle Challenger exploded. I haven’t finished the book, but so far, it seems to be a lament to the loss of the lunar program. It seems a fitting requiem for my hero. I would have liked to have spoken to him. I would have like to have met him. A friend once asked me what I would say to him. I didn’t know then, and maybe I don’t know now. But to shake his hand would have been an honor. I am saddened by his death. And, I am saddened that I will never follow in his footsteps. …this man of instinct and courage, of action under pressure and with a feeling for the systems, was just the right person to save Apollo 11 at its moment of truth. Thanks for that, and the surrounding information, as well as your comments on my other post. I really needed to hear what you said. It reminded me that he truly was a great man. I grew up with the space program, and I recall Neil’s accomplishments when some of them took place. I did not recall his accomplishments in the X-15 and other test aircraft, but it was clearly part of his experience that some others in Gemini did not share, in that he was already a cut above. His performance in saving GT-8 was truly amazing, for acting under pressure, and with such insight into the systems, to save the mission, himself, and Scott. Until then, there will still some people who believed that people couldn’t make a decisive difference in space, Neil left no doubters after that. On hearing the announcement for the Apollo 11 crew (everyone understood this was going to be the first landing), my reaction, even at that young age, was “of course!”. How fortunate that he was, because this man of instinct and courage, of action under pressure and with a feeling for the systems, was just the right person to save Apollo 11 at its moment of truth. I was in summer camp during the mission, but I managed to find out that one of the few TV’s in that part of the forest was set up in a bungalow, and got there early, to be sure of a seat. By the time the EVA started, I was buried under others, we were stacked like cordwood and I was near the bottom; I could hardly breathe but was riveted to that tiny screen. Neil and Buzz were really, really, REALLY on the MOON! My goodness, we can do ANYTHING! It was the fulfilment of something in progress for my whole young life. I still have photos of Neil in New York, where he was in the tickertape parade given the Apollo 11 crew about 3 weeks later, in mid-August. I still have the slides I took of them, taken with my first really serious camera. To call them heroes was an understatement. In the summer of 1973 I was aboard the Canberra, a cruise ship that was chartered to attend a Total Solar Eclipse off the African coast. There were many luminaries on board, and Neil was one of them, although he was a bit quiet and aloof, yet approachable. I had a chance to meet and speak with him, on a couple of occasions during the cruise, and he was on a couple of panel presentations about spaceflight. Our last conversation on the cruise was about his reactions to the crisis on GT-8 and Apollo 11. He asked me if I had a drivers licence. I said yes. “Ever have a kid run in front of your car?” “Yes” I said, “He was chasing a ball” “So what did you do?” “I stopped the car, fast!” “What did you think?” I thought.. “I just stopped the car” “That’s right, but you didn’t think about it, you reacted, right?” “Yes, I had to.” Neil smiled, “OK, then, that’s what I did, that’s how it felt.” With that, he went back to reading a book, and I mumbled something like “Wow” and “THanks”. Years later, I bumped into him at a large museum in Manhattan. “Hey, Weren’t you on the Eclipse ship?” “Yes, did you ever get that degree?” “Yes, I did!” “That’s great”, he said “Can you do me a favor?” “Sure” There was a guided tour passing in front of us. “Don’t tell them who I am, OK?” I laughed or something, and introduced him to my wife. He seemed genuinely pleased to meet her, and she was suitably amazed. It is still possible that we may follow in his footsteps, and our children (or THEIR children) surely will. But on point position for the species we could hardly have chosen better. I recall fondly my too-few contacts with this amazing and humble man. Walk outside sometime, and wink at the Moon. The space program and events surrounding it also seem to have interesting coincidences happen. I think it is very interesting that Neil Armstrong, the first man to walk on the moon, died on a month in which we had a blue moon. I remember watching the landing so well. Like all the other stellar (and some not so stellar) moments that I watched, it stuck in my memory. Thinking of it makes me feel so old too! Thanks for the reminder of the man and the gift he gave us as a nation.